Ten twenty in the morning and at least six working girls were out near the centre of Madrid. Dressed to the nines, most were wearing high shoes, the types that aren’t meant for walking far. Must remember that when I book my next hotel anywhere near the Sol Plaza. Last year Sol Plaza station was Sol Vodaphone. Vodaphone is smart, capitalising on a few years of people reading and saying Sol Vodaphone! The day was hot and the sun very fierce so I bought a new hat. As you do. 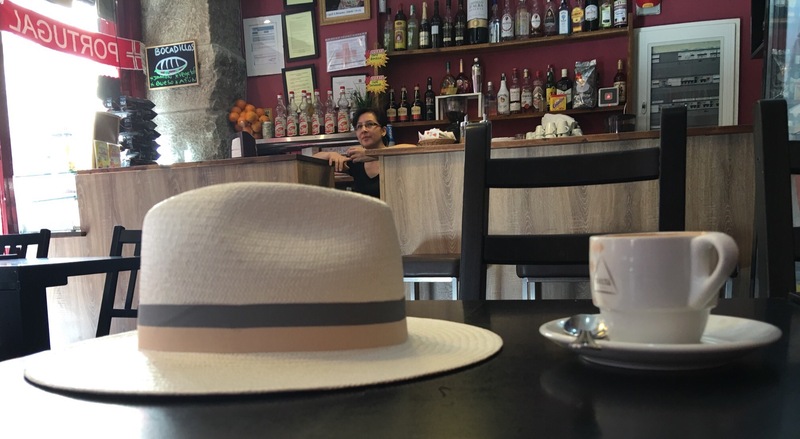 A hat and a coffee. A good start to the day. And I don’t care if the hat looks silly. It’s like a throwback to my schooldays of wearing a panama. Albeit a very different design and colour! 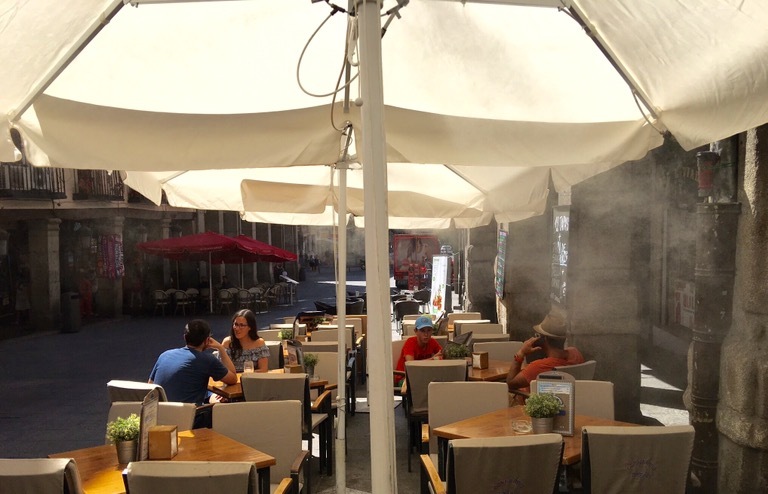 Near and in the Grand Plaza many cafes use a misting system of cooling customers. I thought at first, here we go again, dammed Europeans smoke too much. But no. 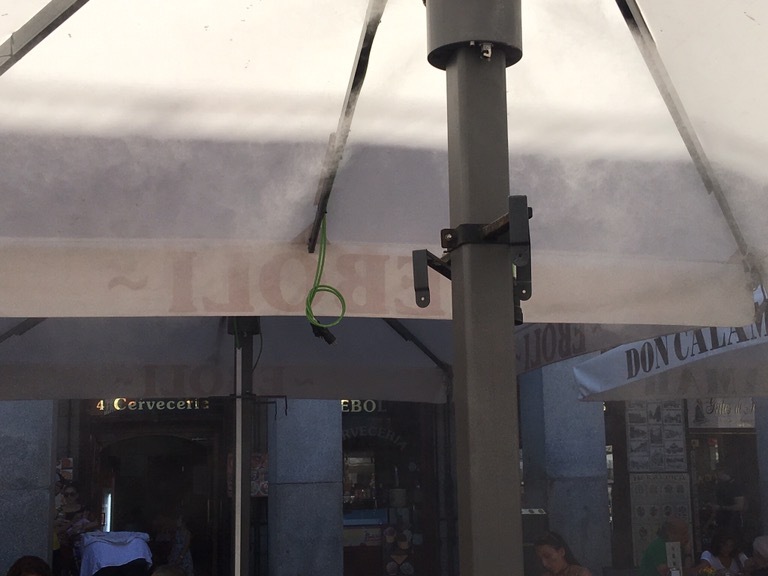 The fogs are from the customer coolers, a fine vapour pulsed out from pipes in the tops of umbrellas. Looks cool….. Finally found a street with adventure gear in the suburb of La Latina. Not the one JP and I liked so much on an earlier visit. Still, progress. Many shoe brands I know. Except for a few icebreaker items, all the clothing brands are new to me. So, very interesting and yes, I bought some very trendy white socks with expensive red bobbles. Positively guaranteed to remove all moisture in your shoes. 😉 We will see. 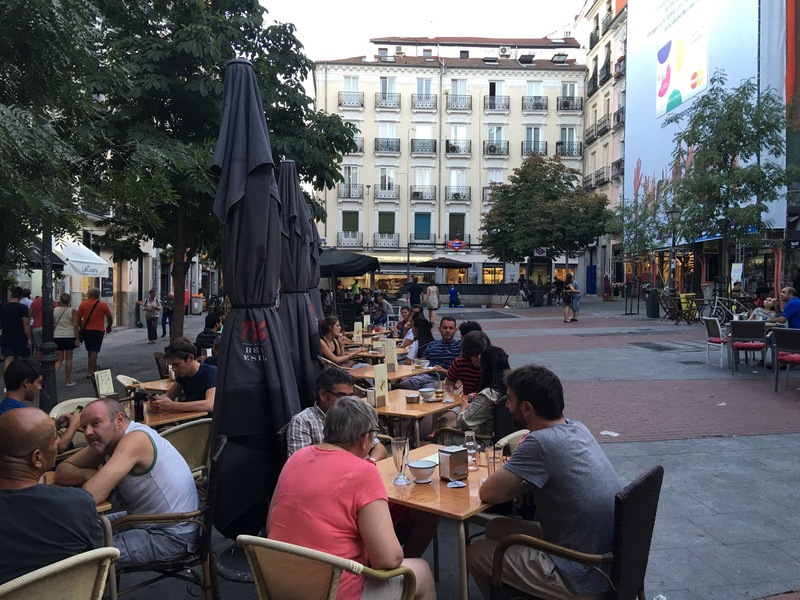 Many shops and restaurants in central Madrid are shut and no, not just because it’s lunchtime. It’s August and, despite the numbers of tourists here, it’s traditional for many people to leave the hot city. And it hasn’t been nearly as busy in the centre as in late May/June. Very good time to visit. And another of my favourite coffee shops was open. Literally, to the adjacent footpath. To my right is the nice swish interior and, to my left, motorbike parking. Beautiful out in the evening. After 9pm, it’s warm and the streets are crowded. 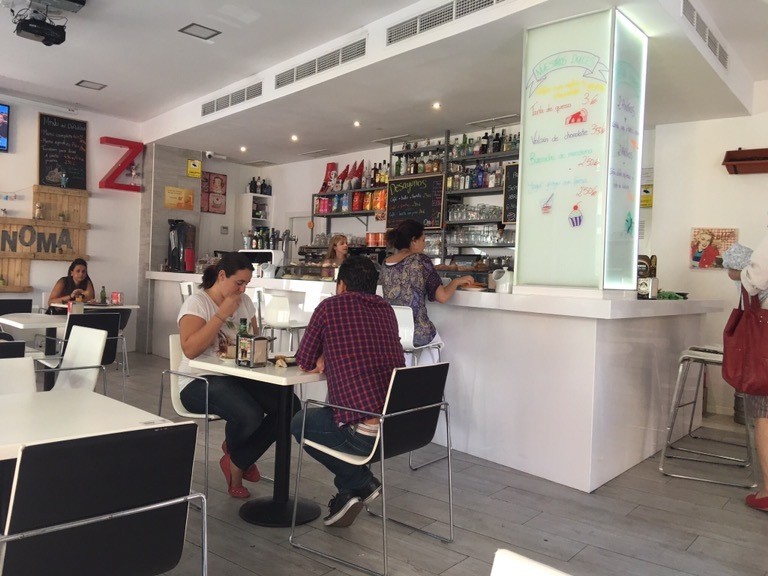 The Chueca station is in the Chueca Plaza with its many busy cafes and restaurants. And, it being Spain, the evening has not yet begun. 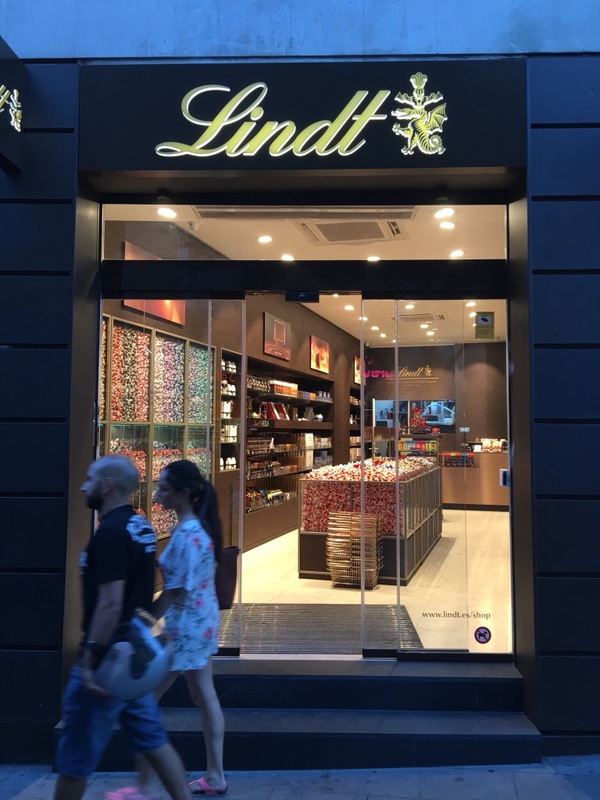 No-one in the Lindt shop. Do you know what happens to Lindt balls exposed to heat? Those in my bag, yes yes, purloined of course, oozed out both ends onto my paperwork. It now looks, well, ugh. And if you eat a melted Lindt ball you risk it running all down your chin as it explodes over you. So, until the weather cools down a lot, I’m off Lindt balls. Had to see the lake over the river down from the king’s castle (left) and the adjacent cathedral (right). If you think that sounds like a fairy tale you should see how it all looks! From below they are largely hidden by trees so you need some imagination. Picture book stuff especially with a very high connector between the buildings. Looks like an aqueduct but I think it was King Freddy’s (some other name I’m sure) private walk. Maybe I’ve seen too many fairies in the heat. Moving on…. It’s a huge area of parkland near the royal palace. At least one King kept a boat on the river near the castle, reached by crossing his private bridge! Tough gig. Don’t know if the present King lives there but the private gardens are well watered, enclosed by a high fence, guarded by the Civil Guard so, maybe. Trees, grass, tracks, bikes, runners and a cafe. The lake is somewhere. A very hot day. At least 30C, clear sun. Three of the three women hat wearers I’ve seen in Madrid today have on panamas and are in this park now 👑. Explain that! Yes, I’m one of the three. Days of street walking and I’ve seen very few wearers of any caps or hats, female or male. Odd. Like all the smokers in streets here, something from the past. Found the ‘lake’. Really it’s a reservoir. 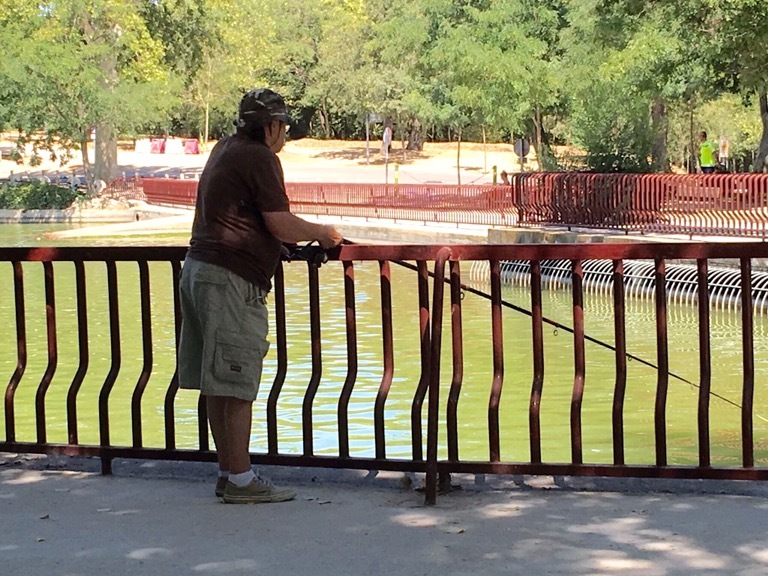 Pretty dirty and I asked the old guy fishing there if you could eat the fish or was he just practising 😋. Unsurprisingly, he said he was practising and seemed repulsed by the idea of eating his catch, if any. Very taciturn. I should have said ‘good luck’ but he didn’t want to talk. 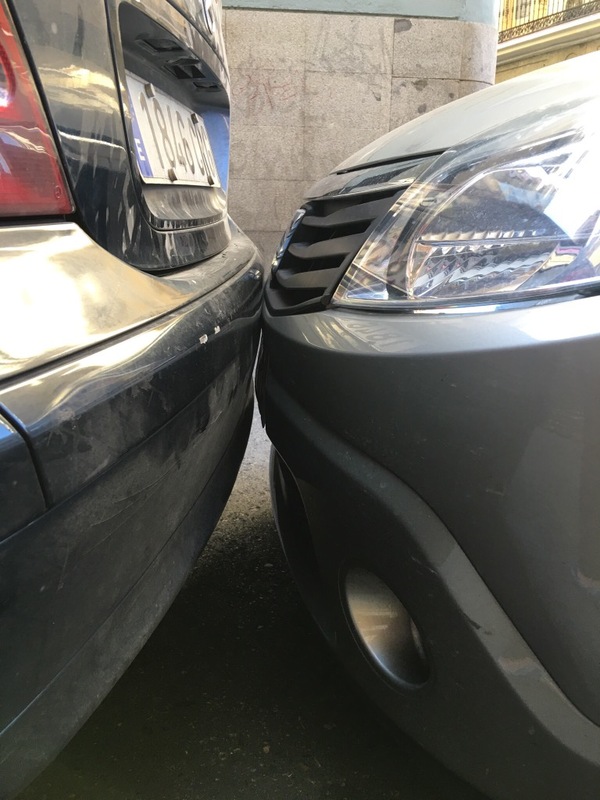 If you think you know how to park, do better. Or explain how you’d get out of this. Both ends of one car were the same. To Salamanca Saturday morning. By train of course as it’s easy and pleasant. Two days and school starts Monday early, with a test to decide your class. I love your hat. please don’t let your chocolate balls, the best balls I’ve ever eaten, Ooze onto your hat! Next time I see you I want to see you wearing it! Great article! Actually, I’ve been enjoying your whole series on Spain. 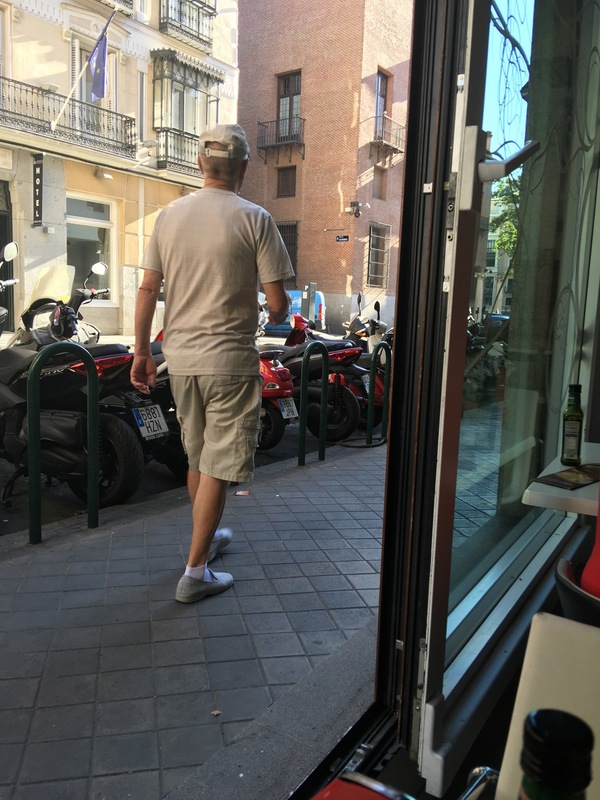 I am dual Spain/US citizen and you really captured the essence of the place. I decided to comment on this one because your description of the working girls triggered my memory from last year’s visit near Sol. They were all lined up, one more beautiful than the next, and I said to my wife “I can understand why you like to go shopping now.” One punch and a bruise to my arm later – it was worth it. Enjoy Spain – I always do. Right now we’re living in Napa Valley, California, also very beautiful. You may enjoy our wine country blog at http://www.topochinesvino.com. Follow us if you like what you see.